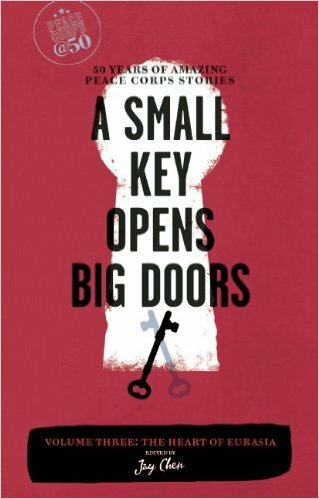 This story was first published in A Small Key Opens Big Doors, part of an award-winning series of four books celebrating the 50th anniversary of the Peace Corps in 2011. The series was edited by Jane Albritton and the volume editor was Jay Chen. Jane encouraged me to put more of my stories together, which led to my writing A Breeze in Bulgaria. The story takes place during our initial ten-week training period, while we were still living with a host family and attending daily classes on Bulgarian language and culture. The Fourth of July! Bulgaria’s Independence Day was the third of March, so the day after the third of July was only the fourth. We were a few weeks into our training on what would have been our American holiday, but on the fourth there would be no day off from training. There was a nod to our national day in the language curriculum, in that we learned an all-purpose greeting for wishing each other happy holiday, “Chestit praznik.” The word for independence, to give the day its proper due, had six syllables and sounded like a little song: nezavizimostta. 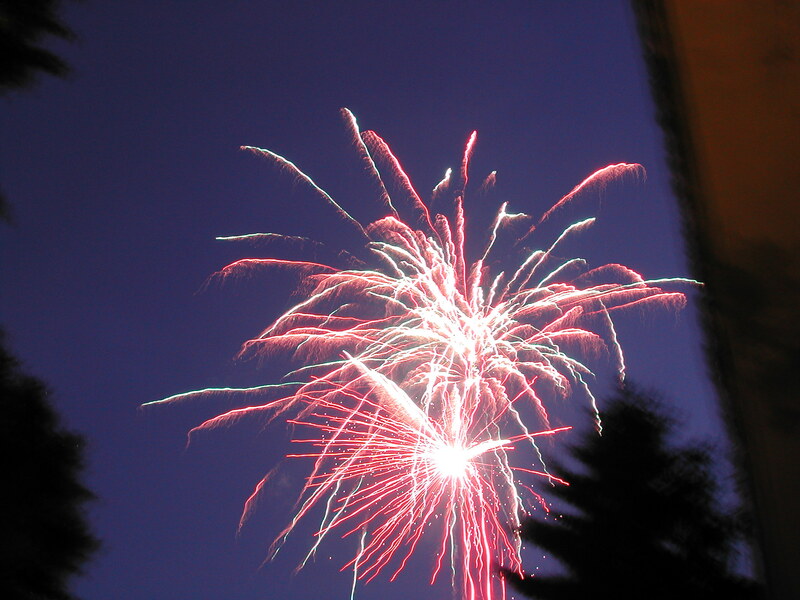 Although the fourth was not a holiday, a celebration was planned for us anyway, after the day’s school activities. Everyone who knew Americans knew what the Fourth of July meant to us; at least the people in Panagyurishte did. They gave a party. After class, we went home and met with Krassimira to take her with us to the Fourth of July party. She was doing her hair when we got there from school, and had changed into a different dress and high heels than she had worn to work that morning. Pavlin was working and couldn’t come to the party, but Krassimira’s sister Magdalena and nephew Rumen were to meet us there. It was about a 20-minute walk to the other side of town, and Krassimira greeted people she knew along the way. Bulgarians do not acknowledge or make eye contact with people they do not know. To do so, as we would expect to be customary in a small town, was considered vulgar. Naturally we had made that mistake for the first few days. On our first night in the country, several of us greeted an older man and he was so taken aback at the audacity of it that he went a few paces ahead on the sidewalk and then turned back and shouted after us, asking what nationality we were. We thought, “Uh-oh, what do we do now?” but he was friendly, even excited. He told us – in a torrent of words that provided only a general idea of what he was saying – that komoonizma was bad and demokratzia is good and he liked Amerikantzi and hoped we liked his country. It was a very effective communication, done with scowls and smiles and hand gestures and tone of voice more than with words. That in itself was a lesson, a valuable template for effective communication. That was our first night in Bulgaria, though, and after our several weeks of learning about the people’s ways and customs we knew such an exchange was a rarity. It had become almost normal for us to try to fit in, not offending people by trying to make them talk to strangers. On the way to the party, Krassimira stopped and talked to a woman with a child. They said something about the celebration, that fireworks would be a part of it and how the noise would scare the dogs. The child did not speak since she was not spoken to, and Stormy and I followed the same pattern. We gave a polite goodbye at the appropriate moment, after being invited with a glance and a nod from Krassimira. Our path took us past the center of town, by the hotel and past the place where the Saturday Market was set up every week. The museum grounds were decorated with red, white and blue paper chains and paper stars hung from the trees – very festive. Magdalena was already there when we arrived, and she gave Stormy a little bunch of flowers with the “happy holiday” greeting we had learned earlier in the day. Flowers were given for almost any occasion, it seemed. There had to be an odd number in the bouquet; to give an even number was unlucky, except for a funeral. The crowd grew to several hundred people with the 67 of us in training, our teachers and Peace Corps staff, our host families and some of their extended families. After a while the Mayor gave a speech. Radost, one of my favorite language teachers, translated. Although His Honor was making an effort to keep it simple for us, we wouldn’t have understood much between “Welcome to Panagyurishte” and “Thank you and good evening.” I suspected that most of the enthusiastic applause the Mayor took as a compliment on his fine speech-making actually was for Radost. After the Mayor spoke, a small group (including Stormy and me) took the stage and sang “The Star-Spangled Banner.” We had practiced it the day before, a cappella, and it came off pretty well. It was a remarkable experience to sing our national anthem there, under those friendly circumstances in a welcoming place so far from home. It was a real lump-in-the-throat feeling. There was food and drink to be had for a small fee, and we stood around for a while eating little brown spicy sausages and chicken sandwiches, with beer and soda. The menu was an approximation of what was understood to be American holiday barbecue food. The drinks were sold in bottles with paper cups provided along with them, upturned over the opened bottle. We were expected to fill the cup and leave the bottle with the vendor. Somewhere along the way we had learned it was considered crass to drink out of the bottle, though as the party went on, some of our younger members regressed to their college habits. The stray bottles were conscientiously and conspicuously collected for return, by a child sent out to make sure none were lost. The drinks were served in the European way, cooled only by the shade. They were cool, not really hot though some described them as such, but it was clear that no ice was involved in their handling. We became accustomed to enjoying our drinks at whatever temperature they were. In some places where ice was available, that became an added treat in itself. A musical group, the town’s own brass band, started playing on a little open-air stage under the big oak trees in the courtyard. A few rousing marches came first, followed by some unfamiliar folk tunes. A few people started dancing but it didn’t catch on. We met some of the other volunteers’ Bulgarian host families and chatted with their grandparents, mothers and fathers, brothers and sisters, cousins, and nieces and nephews. We chatted as much as we could with a vocabulary of a few hundred words and improvised sign language and smiles. By about 9:00 the band had knocked off, the sky was still light, and we had just about run out of things to say and do. Bulgaria is about as far north as Boston, and pretty far to the west in its time zone, so the summer nightfall came very late. I realized the fireworks would not be for another hour and a half, and thought the party might not make it that long. 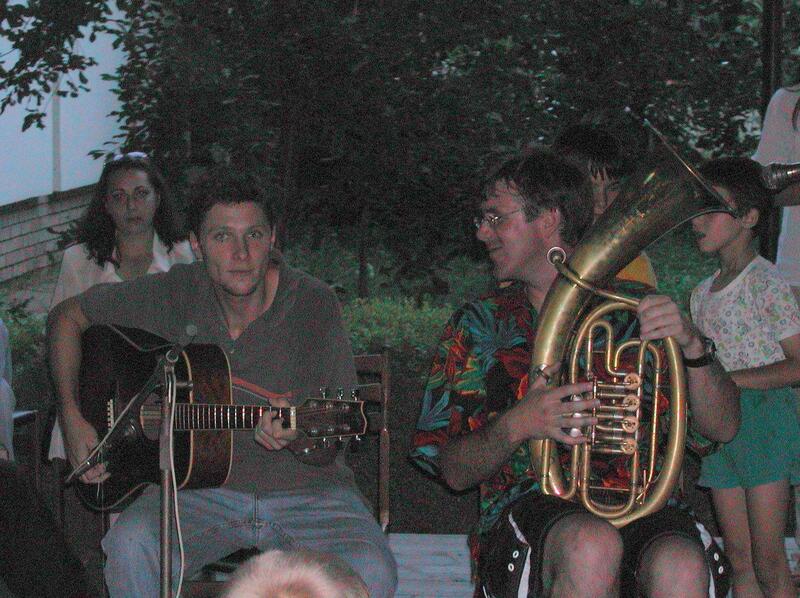 One of our members, Kevin Elliott, borrowed a tuba from a band member and played part of a song he knew. It was a fragment of an arrangement, a counterpoint to some unheard melody line. He played it a few times and then offered to take requests. In response to each request, he tooted the same snippet. This was a different kind of joke for our hosts and they enjoyed sharing in the collective laughter, which nobody needed to translate. Kevin took a big bow to vigorous applause, acknowledging his international acclaim. Then Jeff Hawthorne, a teacher trainee who was a standout in my language class, took the stage with his guitar. He sang a few songs, including a ditty using simple Bulgarian words that one of our language teachers had made up for us. That got everyone laughing, and the party took on enough new life to make it into the evening. When darkness came, the big fireworks display captured everybody’s attention. The warm night swelled with lots of oohs and aahs and applause at the end, just like back home. After the fireworks the music picked up again, with cassette tapes of Bulgarian and American popular music played on a boom box placed on a chair on the stage. We joined in the horo on a folk tune. I learned the step after a little fumbling, and it was fun. Krassi (she asked us to call her that) smiled as she explained a song about summer nights, picking out enough words to get me to understand that it was about a night like this. Stormy and Krassi took turns dancing with me and with each other, and we all danced with groups and with nobody in particular sometimes. Stormy and I had not danced so much in a long time. It was fascinating to listen to the Bulgarian pop music that was so unfamiliar to us and to see how many of our teachers and host family members would sing along with the songs. I appreciated a new thought: the world must be full of things like that. Everywhere there is knowledge and perception integral to the way people understand the world, unknown and unheard of to those outside their circle. I never would have thought that a cobblestone courtyard would make a good dance floor, but everything about this Fourth of July was a little different. The night was warm and everybody was soaked and it was one of those times when the least little movement of air feels like a gift from heaven bringing cool refreshment that makes you smile just thinking about it. We stayed out pretty late for a school night. Walking home along the dark, quiet street, Krassi startled when something flew into her hair, and she instinctively knocked it away. She realized it was a firefly, a word we didn’t know when she spoke it. A svetulka. She explained by making a buzzing noise and finger motion for a flying bug, pointing to a lighted window, and then opening and closing her hand to mimic a blinking light. We looked for them the rest of the way home and didn’t see any more. So then we knew there were fireflies here, or svetulki, but not so many as to take them for granted. Kind of like the fireworks, and like special celebrations on soft summer nights. This entry was posted in About the People by Bruce McDonald. Bookmark the permalink. I love this story! I first read it more than a year ago, and since then it has popped into my mind numerous times. Whenever I hear of a firefly, I think of it. Aww, sweet. Thanks Alexi. Another one of my favorite things in the book is on the Acknowledgments page, with your name listed for the help in editing. You’re so insightful! And I really loved reading your recent book, Streamlining with Style.